There’s a lot of interest these days in adding Twitter updates to Facebook Fan Pages. Sending Twitter updates automatically to your Facebook Fan Page is a great way to expand to your audience, attract more attention from the web, and connect to more prospects who are interested in your business, products, and services. However, there are a lot of very complicated “how to’s” out there that give long, drawn out explanations on how to make this happen. Well… let me help you see through all the noise by giving you a fast, simple way to automatically send your Twitter updates to your Facebook Fan Page and have your tweets show up in your Fan Page stream on your wall. Every Twitter profile has an RSS Feed. However, in the beginning of 2009, Twitter requires all profile feeds to be authenticated. This means, your Twitter RSS feed cannot be read by third party applications that do not automatically authenticate your Twitter feed. Copy the new RSS feed URL that you’re provided. This new RSS feed URL is the authorized (or unlocked) version of your Twitter feed. Now that you’ve got an authorized RSS feed of your Twitter updates, we are going to add that feed to your Facebook Fan Page in the “Notes” application. Click the “edit page” link directly under your Fan Page profile picture. Once you click “edit page”, you’ll now be looking at the settings dashboard of your Facebook Fan Page. Go ahead and find the “Notes” application and click “edit” under your Notes. Once you click “edit” under Notes, you’ll be taken to your Notes page. 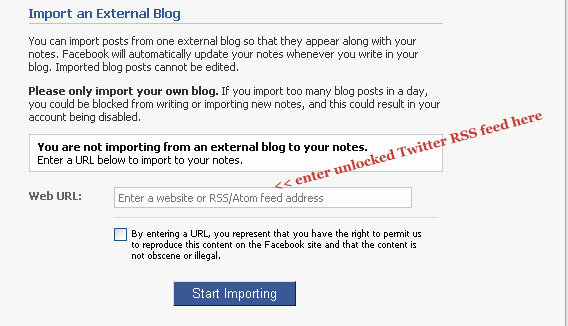 On the right hand side of the page, you should see a link called “import your blog” > go ahead and click that link. The final step is to get your Tweets to automatically update your Facebook Fan Page wall. Go back to your Fan Page homepage and click “edit page” again underneath your profile picture. Once you click “Additional Permissions”, click the box that says “Publish to stream” > and then click OK.
And that’s it! Each time your Twitter profile updates with a new tweet, your Notes application on your Facebook Fan Page will update, and that new update will automatically post to your Facebook Fan Page wall. Along with automatically updating your Facebook Fan Page with your Twitter udpates, you can add your “Notes” to the row of tabs along the top of your Facebook Fan Page. To do this, click “edit page” directly underneath your Fan Page profile picture. Scroll down again to the “Notes” application, and click “Application Settings”. Once your Application Settings screen opens, you will see the options for both Box and Tab. Once you’ve done that, you can go back to your Facebook Fan Page homepage and you should see the Notes tab at the top of your Fan Page. You may need to refresh your screen to see the updates. If you have any questions about anything covered above, as always, feel free to contact me for help!